Underage drinking has become an increasing problem in the UK in the last decade, with more than a third of 11 to 15 year olds admitting to drinking regularly. The problem has worsened due to the introduction of so-called 'alcopops' – alcoholic beverages that are a mixture of alcohol and fruit juice and are very easily consumed by minors. How do I Know if my Child is Drinking? Most children who drink underage will do so when there is little or no adult supervision, for example, when they are staying with friends. Some children will drink on the street and then come home and try to pass themselves off as being sober. What can I do to Prevent my Children Drinking? This is a question that can have many answers and there are no right or wrong ones. Keeping an eye on your child's movements is perhaps the best course of action. If they have a mobile telephone, ask them to check in every couple of hours to ensure not only that they are safe but that they are sober. Many underage drinkers are often caught out by their refusal to answer calls from home if they are out with friends. This can be seen as a rebellious streak but more often than not it is out of a desire not to be discovered doing or being somewhere they shouldn't. If your child is going to a party or function, give them enough money to see them through the evening. Do not simply hand money over, as this is too tempting an opportunity to pass up. 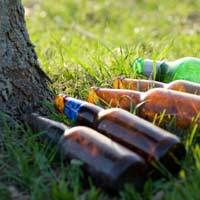 Under new legislation, it is now an offence for under 18s to persistently possess alcohol in a public place. Police in England and Wales have the power to confiscate alcohol from underage drinkers, and they can move on groups of children aged 10-15 years old. Those selling alcohol to minors can be charged if they are caught committing the offence twice in three months (it was previously three times in three months before they could be prosecuted). In addition, local councillors can now call for a review to restrict or remove an alcohol retailer’s licence, if they are suspected of selling alcohol to minors. What Should I do if I know Someone is Selling Alcohol to Minors? Many people tend to give the individual or shop Selling Alcohol To A Minor the benefit of the doubt, especially if it transpires that the child has made themselves look much older than they are. However, all licensed premises, including pubs, clubs, supermarkets or corner shops, have a legal responsibility to ask for proof of identity and age. They should reasonably expect to refuse anyone who looks under age and cannot prove their age. If you suspect someone is selling alcohol to minors, make it known to them that you are aware of the circumstances. Even if they do offer to ensure that the situation does not arise again, you should inform your local council or Trading Standards officer.